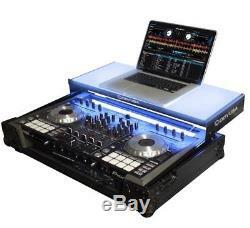 Odyssey FFXGSPIDDJSX2BL Flight FX Series Pioneer DDJ-SX / DDJ-SX2 DJ Controller Glide Style Case. Flight FX Glide Style Premium FX Platform Edition with a Bottom 19 1U Rack Space. Odyssey presents the Flight FX FFXGSPIDDJSX2BL case featuring our patented premium FX Glide Style platform and a 1U 19 rack mount space below the controller section that's perfect for rack mount gear such as a wireless mic system, power strip, drive rack, or storage drawer. This case is for the DJ who loves to be the center of attention as they rock the crowd on the dance floor. There's just no other case out there that can make that happen better than this special edition LED platform controller case specifically made for the Pioneer DDJ-SX and DDJ-SX2 DJ controllers. Other features include our exclusive, patent pending, high-density bevel foam interior that neatly angles upward raising the controller for an efficient control surface and the stylish V-Cut removable panel allows for easy access to the front controls and headphone/mic jacks. All Black Anodized and Powder Coated Hardware. Patented Gliding FX Laptop Platform. Removable 1U 19 Rack Mount Rails Below the Controller Space. Rack Rails Can Be Positioned for Front or Rear Mounting. Removable V-cut Front Access Panel. Exclusive Patent Pending Bevel Foam Interior. Plenty of Space for Cable Management. 7 Color-Changing LED Panels with Controller (linkable to other FX cases). LED panels Effects:(1) Set to 1 Color or Random Color Changing, (2) Slow Flashing Color Changing, (3) Fast Flashing Color Changing, (4) Auto Color Mixing Fade in Fade out, (5) Sound Activated. The item "Odyssey FFXGSPIDDJSX2BL case for DDJ-SX / DDJ-SX2 Glide Style DJ Controller" is in sale since Friday, August 3, 2018. This item is in the category "Musical Instruments & Gear\Pro Audio Equipment\Cases, Racks & Bags".